Not only does North Africa have a strong tradition of making beautiful and ingenious astrolabes, the origins of the instrument may also be described as African. 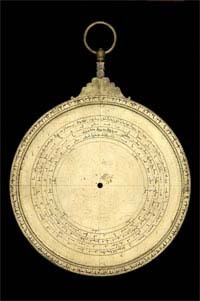 Although the invention of the astrolabe cannot be precisely located, it was the Greek astronomer Hipparchus, reportedly working in the Egyptian port of Alexandria in the second century BC, who developed the projection on which the instrument is based. Further, it was Claudius Ptolemy, some 300 years later, who provided the first thorough treatise on this projection and who wrote as though he had in mind a physical astrolabe. Two centuries later, again in Alexandria, Theon of Alexandria wrote the first complete work on astrolabes, treating both the underlying mathematics, that is, the theory of stereographic projection, and the construction of the physical instrument. To this he appended a long section on how to use an astrolabe. These pioneering astrolabists were closely linked to Africa: Hipparchus worked in Alexandria, while Ptolemy and Theon were born, lived and died in Egypt.